Portsmouth's administrator Trevor Birch says the debt-ridden club have a "50/50" chance of survival as they continue the search for new owners. Birch says he is talking to two interested parties but is yet to receive an offer or see proof of funds. Speaking at Thursday's creditors' meeting, Birch added "the club only has enough cash to last until June". However, representatives of major creditor Balram Chainrai reiterated his desire not to let the club go bust. Chanrai, who bought the club in 2010 before selling to Convers Sports Initiatives, is still owed £19m but has previously said he will write off some of that debt to save them. The club are currently £58m in debt and searching for new owners. On Thursday unsecured creditors voted to form a committee who will represent the views of those owed money by the club. That committee includes the Professional Footballers' Association (who have registered a claim of £26m for past and future payments), HMRC who are owed £2.3m, as well as former owners CSI and Portpin, while Portsmouth City Football Club LTD make up the five-member board. "I am still in discussions with two parties, one of whom is more serious than the other," said Birch, from administrators PKF. "We have not seen proof of funds nor are they making the right noises to make me think they are about to buy the club. There is no imminent bid from them." Birch added that he was still hopeful previous owners Portpin, who are led by Chainrai, would help save the club. It emerged Chainrai has £12m secured creditors' status on the club and £7m unsecured. 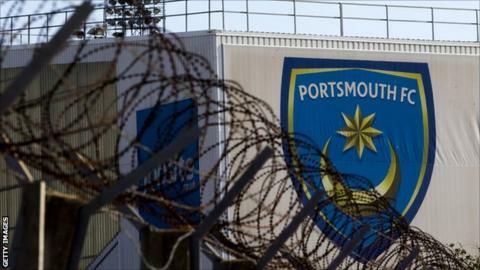 A representative of the Hong Kong businessman spoke at the meeting and said Chainrai would not let a club with a "proud history like Portsmouth" be liquidated. Among others, Chainrai was represented by brother Deepak who refused to comment when approached by BBC Sport following the meeting. The Football League will hold their Annual General Meeting on 2 June and Birch is under pressure to convince them Portsmouth have enough funds to take their place in League One next season. Birch also dismissed the idea of a fans' takeover of the club, but admitted it could work if the club were liquidated. "In the absence of a high-net worth individual I cannot see them making a bid to buy the club," added Birch. Meanwhile, former chief executive David Lampitt, who was made redundant in February, was at the meeting and defended his time at the helm. "The previous regime was never self-sustaining, CSI bankrolled the club and bought players they could not afford," said Lampitt. Birch said any new owner buying the club would have to be prepared to make a £5m loss in their first year of trading while it also emerged, that as of 20 April, PKF were due £650,000 in administration fees. Lawyers Pinsent Masons said the whole process had to date cost the club £190,000 in legal bills. Unsecured creditors at the meeting voted against HMRC's modifications to the administrators proposals. Among the modifications proposed by HMRC were an investigation into the current company (Portsmouth Football Club 2010) as well as the liquidation of that company following a Company Voluntary Arrangement (CVA). The creditors also voted in favour of the administrators proposals while Birch added there were likely to be further redundancies and player exits as they look to trim the club's wage bill. Pompey are still owed £14m in parachute payments from the Premier League although that payment will be lost if they are liquidated. "We are doing all we can to find a successful outcome before the money runs out," added Birch. "In our view, a sale of the club as a going concern and subsequent CVA will result in the best possible outcome for everyone involved, including the creditors. "Time is not on our side, though, and we only have a small window to restructure the player cost base."